Personalized XXL Hollywood 18K Gold Over Sterling Silver Monogram Necklace. It is time to make a statement with the XXL Large Monogram Necklace in 18K Gold Over Sterling Silver. This beautiful Gold Monogram measures at over two inches and can be fully personalized with up to three initials of your choosing. It is an extremely Hollywood trendy necklace, allowing you to show off your uniqueness in a fun, fashionable way. 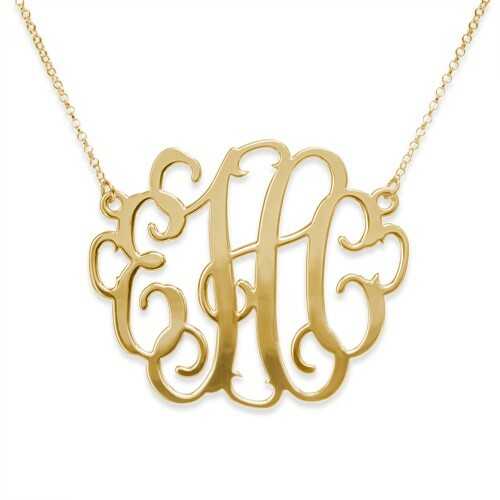 The 18K Gold Over Sterling Silver XXL Monogram Necklace also makes a terrific gift for brides and bridesmaids. The pendant comes on a very sturdy Rollo Chain, also plated in 18K Gold Over Sterling Silver. This XXL Statement Monogram Necklace is also available in and Sterling Silver or 18K Rose Gold Over Sterling Silver! Made in real 18K Gold Plated Sterling Silver 0.925. This is the perfect gift for any one and for any occasion. Height of pendant: 45 mm x 52 mm / 1.8" x 2"